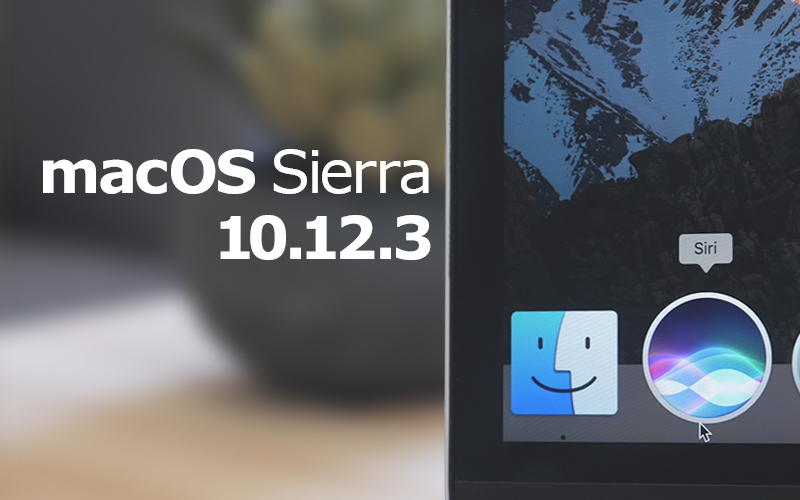 Apple today released macOS Sierra 10.12.3, the third update to the macOS Sierra operating system that launched on September 20. macOS Sierra 10.12.3 comes over a month after the release of macOS Sierra 10.12.2, and has been in testing since December 14.
macOS Sierra 10.12.3 is a free update for all customers who are running macOS Sierra. The update can be downloaded using the Software Update function in the Mac App Store. No specific changes, bug fixes, or feature additions were discovered during the beta testing process, and Apple only said the update "improves the stability, compatibility, and security of your Mac." Apple's release notes paint a more complete picture, stating that the update improves graphics switching for the new 15-inch MacBook Pro, fixes issues with Adobe Premiere, and includes important fixes for Preview. - Improves automatic graphics switching on MacBook Pro (15-inch, October 2016). - Resolves graphics issues while encoding Adobe Premiere Pro projects on MacBook Pro with Touch Bar (13- and 15-inch, October 2016). - Fixes an issue that prevented the searching of scanned PDF documents in Preview. - Resolves a compatibility issue with PDF documents that are exported with encryption enabled. - Fixes an issue that prevented some third-party applications from correctly importing images from digital cameras. Enterprise content: Resolves an issue were network or cached user accounts (such as Active Directory accounts) using the maxFailedLoginAttempts password policy were becoming disabled. macOS Sierra 10.12.3 will likely soon be followed by another update, as Apple has been committed to regularly making updates to the operating system since its September release. MacRumors, making the daring predictions. Here's a little behind the scenes look at the decisions we make... I added that because I don't like to end posts with blockquotes (it looks funny) but I didn't really have much else to say about 10.12.3. I do expect 10.12.4 alongside iOS 10.3! Apple, what are you doing these days? Safari still kills entire system on specific websites, with intel 4600 GPU. Apple, what are you doing these days? Admittedly no version of OSX has been perfect. However, I do not recall any of this being an issue with such as Snow Leopard. People like to paint a grass-is-greener picture of Snow Leopard, but it's not as though that version was perfect. There were eight point releases for it, one of which (10.6.3) needed a "Supplemental Update" because its original release had some issues. * Improves reliability of Ethernet connections. There were also weird off-shoots like the "Snow Leopard Font Update". Which, incidentally, included PDF-related fixes. You'd think something like DVD playback and Ethernet connections would be rock-solid by the seventh major release of OS X. But alas. They weren't. Perhaps someone could explain how that once working fine no longer does several versions later? Well, regressions generally happen when code is modernized, optimized, or for other reasons replaced by an equivalent. In this case, Apple appears to have tried to unify some of the PDF code between iOS and macOS. One positive effect of this is that you can now print to PDF from any iOS app (though the UI to do so is bizarre ('https://9to5mac.com/2016/09/18/how-to-print-to-pdf-from-iphone-and-ipad-ios-10/')). The negative effect is lots of breakage ('http://mjtsai.com/blog/2016/12/21/more-macos-preview-pdf-trouble/') in the meantime. I hope this update fixed similar issues for others, but I've decided to wait until the next hardware rev before I buy a new 15". I ordered a base 2016 13" (no Touch Bar) cheap at Best Buy this weekend, and I'll use that for now... if I decide it's worth the risk to open it. This 15" was the first Mac I've ever returned after opening it. I'm really disappointed in the number of issues I had over a relatively short period of time using it doing pretty much nothing but software development. These were, in my opinion, pushed out of the factory way before they should have been. I get that OS updates are needed and that new hardware isn't going to be perfectly supported all the time, but come on. It sounds like, even after this OS bump, there are still going to be a lot of people with issues, and I had far too many different problems on a new system that I barely stressed. I miss the old days when they really did just work. Though, if it's anything like WatchOS 3, it could double/triple battery life on the new MBP but people around here would still find reasons to complain about it. People like to paint a grass-is-greener picture of Snow Leopard, but it's not as though that version was perfect. Thats because the grass was greener and it still is. Snow Leopard offers so much more by offering less, a lot less. No iOS infiltration, Fast and rock solid stable. OS X 10.6.8 was when the platform was at its pinnacle. Snow Leopard is vastly superior to any other release on older Macs. iOS infiltration has all but killed the Mac platform. Safe Mode not working is a bad sign. Phew. Step one on that link - disconnect all external drives (I have 3). Logged right in. Thank you. Add the time remaining battery indicator back!